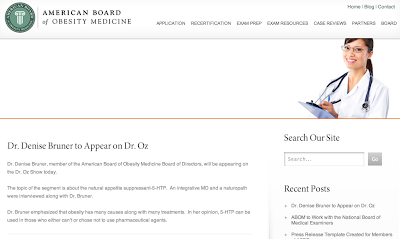 Weighty Matters: The American Board of Obesity Medicine Must Choose: Quackery or Quality? The American Board of Obesity Medicine Must Choose: Quackery or Quality? 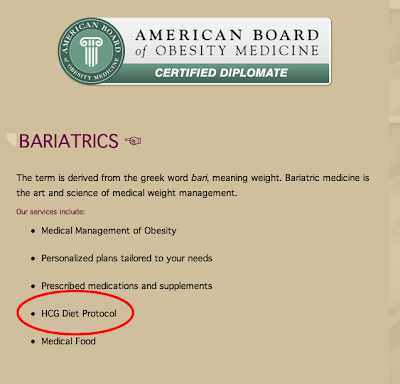 Since 2005 I have been a certified Diplomate of the American Board of Obesity Medicine (ABOM) - now a joint venture between the American Society of Bariatric Physicians and the Obesity Society - and in a few more years I'll be faced with the choice of re-certifying, or letting my credentials lapse. Part of my decision no doubt will be whether or not I feel the ABOM and I are on the same page in regard to science, medicine, ethics, and values when it comes to obesity medicine and I'm not convinced right now that we are. Both the press release and the Facebook update were quickly removed after I pointed out that given the ABOM's ultimate aim to be accepted as a credible medical organization it might be best to not promote 5-HTP supplementation for obesity given that the evidence base on its utility is anything but robust (here's a pubmed search that includes the 25 total citations that mention 5-hydroxytryptophan and obesity whereby the most generous take on the research would be that in the late 1980s and early 1990s two small studies suggested the possibility that 5-HTP supplementation might help ever so slightly with weight management). But that's not the end of the story. While I was heartened that the ABOM saw fit to rapidly remove their endorsement of a nationally televised promotion of a non-evidence based supplement, I still struggle with Dr. Bruner's ongoing inclusion on the ABOM's board. I struggle not simply consequent to Dr. Bruner's at best highly preliminary promotion of 5-HTP to literally millions of members of a very trusting public, I struggle because Dr. Bruner is currently a provider of the, "HCG Diet Protocol". Below is a screenshot from her office's website, and because I found it so incredulous that a board member of the ABOM was an HCG diet provider just to be sure I called her office yesterday and confirmed that if I paid Dr. Bruner $200 for an initial consultation, and then an additional $800, that she would inject me with HCG daily for a month. The evidence base to date on the hCG Diet is clear. It's quackery. "We conclude that the scientific evidence does not support the use of HCG for the treatment of obesity. This position is in agreement with the U.S. FDA. The Obesity Society is committed to advocating the use of therapies for the treatment of obesity that are evidence-based and rejects those that have been shown to be ineffective." "Obesity is a chronic disease which is best treated by a physician who specializes in weight loss and practices medicine based on sound scientific principles. Unfortunately, hCG does not live up to those standards." 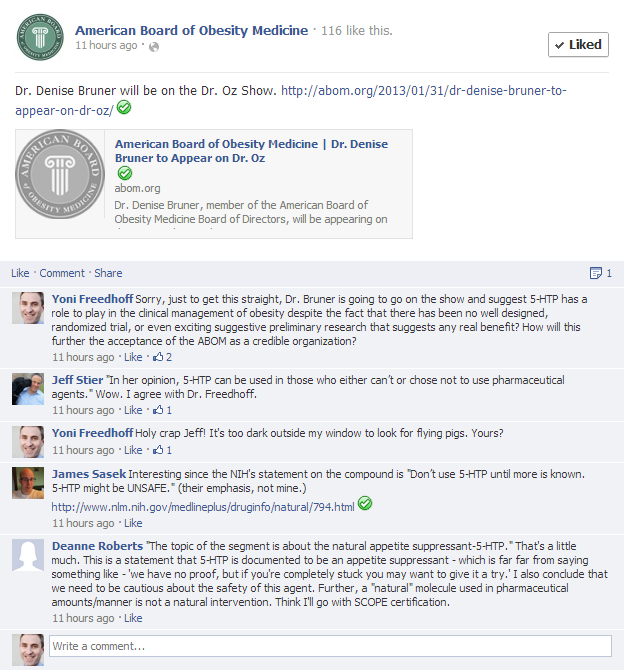 Dr. Bruner's practices, both in what I see as a markedly overhyped promotion of 5-HTP on national television and her use of hCG on her patients, run contrary to my take on what represents evidence-based obesity medicine, and the fact that she sits on the ABOM's board gives me great pause as to the value of that certification. So too does the title of one of the ASBP's upcoming webinars, "Controversies Concerning HCG for Weight Loss". Malpractice isn't controversial, it's malpractice. Perhaps with this post the ABOM will see fit to consider whether or not Dr. Bruner represents their organization's aims, and moreover, whether or not there should be some mechanism to de-certify physicians whose practices belie the ABOM's standards of practice. At the end of the day if the ABOM is hoping to be deemed credible it's going to have to choose to stand strongly against quackery and it's going to have to do so without external blowhards like me needing to point that out.